If you’ve visited us this week you will have noticed the physical changes that are taking place to the exterior of the watermill and mill house. It is amazing us how quickly things are moving forward as part of our HLF funded watermill project, thanks to the hard work by the guys at Messenger Construction. 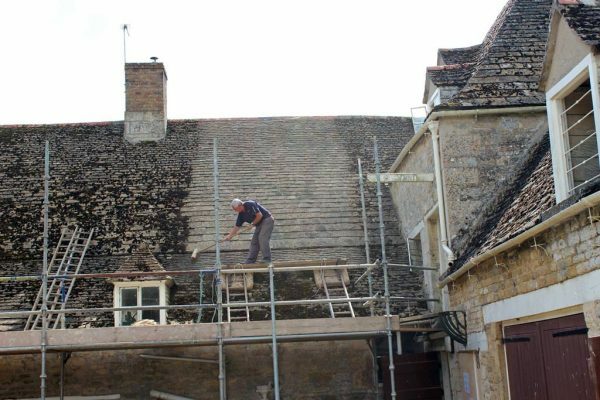 Over the last few days the Collyweston slate roof has been cleaned and treated with an anti-fungal spray to stop the moss growing back. As you can see from the photograph (below) there was a real difference in the colour of the roof tiles once the moss and lichen had been scraped away. Those of you who know the mill house well will be familiar with the old sitting room, which had the pram and chairs in it. 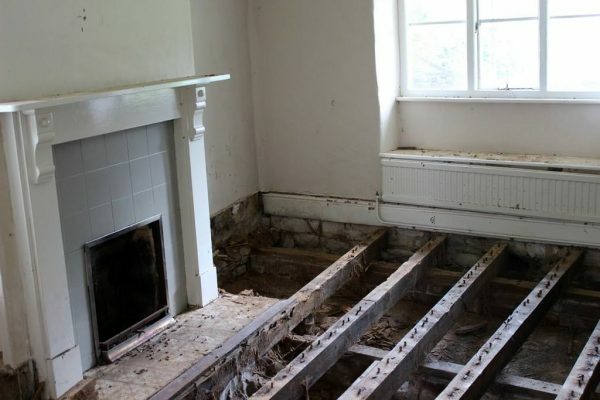 The floor has been pulled up in the room to reveal the original floor joists (which look a bit like roof beams but on the floor) and some will have to be replaced due to their deteriorated state. Overhead, on the second floor the ceilings have also been pulled down, exposing the original beams. Upstairs, in what will be the office, we have re-opened a hole in one of the walls which led directly from the mill house into the watermill, however when we knocked through we noticed that the floors were at different levels and did not meet up. The hole must have originally been used as a hatch. Inside the mill, the narrow passageway that used to lead past the waterwheel has been widened and tie-bars have been put in the bakery so that when the roof is taken off the walls won’t collapse. Tie-bars literally tie the walls together. Please check back next week for another update on the mill works.